@Rcoutme, what are you using to open it? I'm currently using WinRAR v4.11 to archive it. Do you have either WinRAR or 7-Zip on your computer? I've tried it and it works like a charm! And yes I will be playing a pally while wielding "The breacher" you created Troodon! @Cler1c, this means that you can't assign proficiency points, which means trying to equip weapons not made for this combo. However, while you cannot normally equip a bow of any sort on such a character, EE Keeper does not distinguish class limitations when assigning weapons. Find your weapon of choice, add it to the appropriate weapon slot, make sure to add some arrows to a quiver slot, and you can still use a bow that way. Your friend will need to be careful so as not to unequip either the quiver/arrows/bolts or the bow/crossbow, as she will need to resort to using EE Keeper to re-edit them back into place (and I cannot vouch for editing multiplayer save games). I'm afraid that's the best you can do. I just want to edit my character so I can actually have some fun on my ipad instead of dying all the time and running out of gold! EE Keeper will work in a virtual machine, the installation is a copy and paste process. For EE Keeper, you don't use any additional files that are not included within the archive. It deals with the installation and language (dialog.tlk) itself when you change the settings. I'll just show you the steps I used to get it working on a Windows 7 VM running on VMWare (it's not Virtual Box, but they are all very similar). I'm going to assume you have all the necessary files for the standard BGEE installation, so I'll start step 1 after that point. 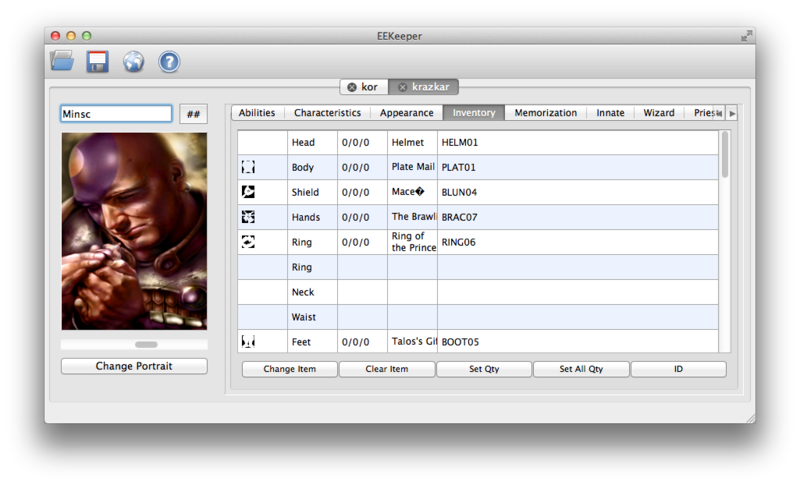 Step 1: Copy the contents of the downloaded archive, EEKeeper_1.0.1.rar, into a new folder. This can be anywhere, in the Program Files directory with a shortcut to the desktop, or a new folder on the desktop. Then try and run EEKeeper.exe. Step 2: Enter the location of your BGEE installation and language. Then press OK. Step 3: Restart EE Keeper. If this is your first time, then it won't actually restart. Step 4: Make sure you have copied the save games to the Documents folder. 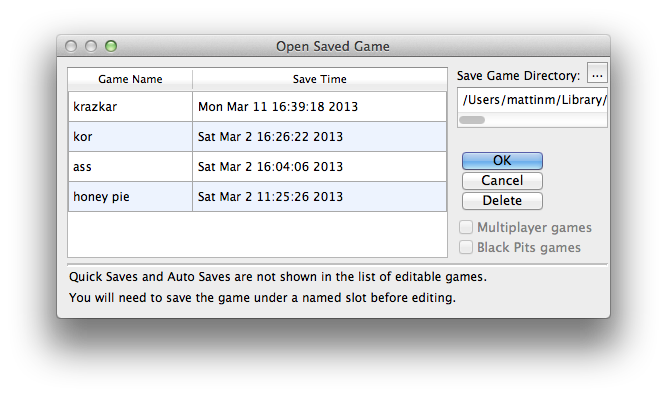 Step 5: Select a save game and click OK. If it cannot find the text resources, then the most likely cause is that you haven't set the language option. However, I am using a Windows OS with a Windows VM, so using Windows via a Mac might be different (it shouldn't be, but I can't guarantee it won't). Just wanted to pop in and give everyone who is waiting on the Qt version for cross-platform compatibility an update. I've finished the conversion of the guts of the source that loads the resources, game file, creature files, etc to Qt successfully, and can load a game up fully (confirmed with a debugger that all characters, etc loaded correctly). But I'm getting a memory leak somewhere when it comes to deleting the objects loaded up on closing, and I'll need to figure that one out before I move on to saving games. Once the leak is ironed out, the saving process should be straight forward (it should "just work" with the conversions I've done), and then I'll get back to finishing the conversion of the GUI, which, funny enough, is proving to be the simplest part. Hopefully I'll have made some good progress by next weekend! @mattinm - One key insight of the Open Source movement is that debugging parallelizes well. So feel free to share the pain, I'm sure there are developers on here who would be happy to help you track down the leak. @Nifft - I actually got the bug sorted out . I've now tested, and I can load all my saves, alter them (tried just messing with attributes and names), save them, and then load the new BALDUR.GAM in BG:EE!! I'm sure there are a few hiccups in there, but I'm gonna get cracking on the GUI this week and hopefully have something presentable soon. As soon as it's in at least an Alpha-worthy state, I'll see about creating a fork on the EE:Keeper sourceforge page and repository for now while testing, etc is done to ensure full compatibility. All that will be worked out with @Troodon80, of course. Another consideration is updating the license present in all the source code, etc, to determine what the best way is of ensuring up-to-date credit is maintained, which is a pretty substantial portion of OS licensing, etc. But, again, that can be worked out. Also, are you guys putting the source up on github or someplace? Is is possible to specify the location of Save/Character directories? The App Store version of BGEE seems to bury these within a documents folder in Library which EE Keeper cannot find. @RichieGroinstab, not at the moment, but I will do that in the next build. When entering East-Baldur's Gate a strange music starts looping and there's and awful and ear-tearing ambient noise. Tried this few times and always the same. /E Can't be sure if it was the shadowkeeper or not because now the bug appears every time I enter the area. Why not call it EnhancedKeeper? @Cler1c: you could edit the weapon you want to use itself, so that it is able to be used by a cleric for instance. 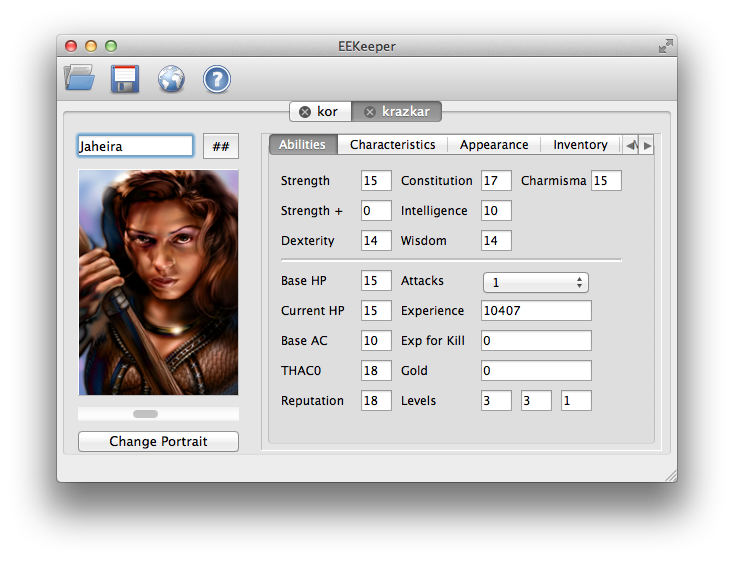 Then add the proficiency points of you choice with EEKeeper and you're good to go. In the past I used IEEP for item editing, but that doesn't work too well with EE. DLTCEP does, and NearInfinity might as well. I vote for this as well. What's wrong with a larger window...? I'm just curious - how was this program written? How did you know how to extract the resources from the game, and what language did you use ? @Sgthawker & @Sjerrie, it's more of an issue with how it was written from the beginning. Trying to make the window resizeable manually is a little difficult, and would be easier to do it programmatically. As it currently is, I resized the window from what it was in the original Shadow Keeper. One of the reasons for the set size is to make use of the space, and to ensure you don't have an abundance of white-space. It's something I will look into in the future, though, and possibly include options from different tabs into a single one. Currently, however, my plans are on hold due to work. So I'm biding my time and I am going to see how the Qt version, by @mattinm, comes out. Once the Qt code has been completed, I will address some of the other issues and possibly work with other members of the community in conjunction with @mattinm in order to make translations for EE Keeper (no guarantees, but it would be nice). @saox, currently it's all written in C/C++, but looks set to change to Qt so as to be compatible cross-platform. @Flashburn, nice name, currently trailing behind EE Keeper, though. If more people can agree on a name other than EE Keeper, I will change it . Is it me, or is the item list incomplete? @Akuzed, I haven't gone through every item to make a comparison, but as far as comparing the list to that in DLTCEP, all the ones I've looked at are there; all the SW1Hxx, SW2Hxx, SHLDxx, SCRLxx, AMULxx, BAGxx, and CHANxx are there. I would assume that everything is there, but like I said I haven't gone through every item . Here's a few screenshots for those interested in the progress so far. There's a little bit of funniness with the Bitmap stuff for items / spells, etc, and there's a few tabs left to do, but it's almost all there now! There's also some weirdness with pulling in resource names at times. Where possible, I've had the window stretch (see the inventory tab screen shots below; as you drag the window about, the inventory part grows), and I've combined everything to hopefully make translations as painless as possible. For non-standard installs, you can choose a documents folder (as seen in the screenshot for Open Game), as well as an Installation Folder. Note that I use Mac OS X, so the screenshots will have that feel to them. Windows would have a WIN32 feel to them. How do you get it to work with BG EE installed from Steam? @zadkielmodeler, since I don't have the Steam version, I can't offer any real support.
. I can only assume that the save games are still in Documents. If so, it should work fine. I hope that at least helps . Again, since I have no idea how BG:EE is set up through Steam, I cannot offer detailed information. Someone else may be able to help better than I.
I have a feature idea. It might be possible to upload a list of "Affects" to my character? I remember being able to have no pause between spells, Reduce spell spell cast time, increase regeneration amount. I was just wondering if there was a way to save these choices and upload them for other users to use and then they'll be able to use it as well. 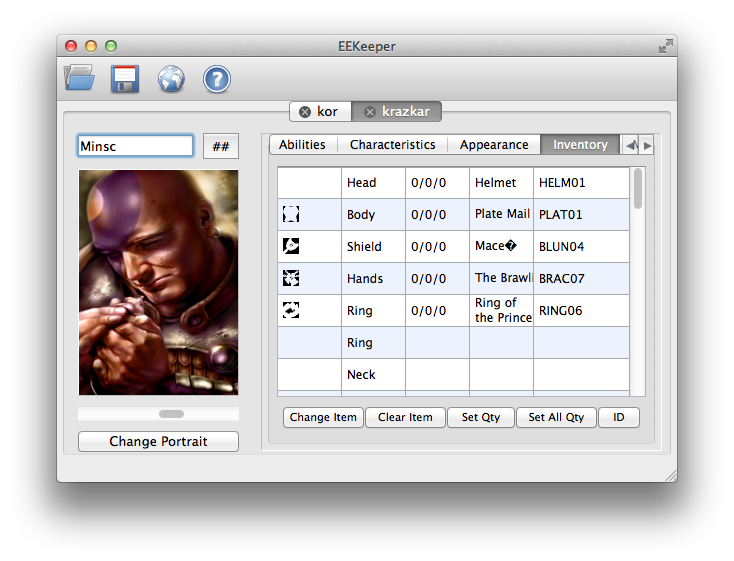 Just a thought, wonderful job with EEKeeper! One bug I've found is that if you change the number of spells someone can memorize, they'll revert back to the normal amount upon leveling.